I don't know if this is intentional, but the anti-benders' masks look like Guy Fawkes masks. Gotta be intentional; I thought the exact same thing. Katara is still alive?? Doesn't this take place over 80 years in the future? I mean, that's cool she'll make a cameo, but she's going to be ANCIENT. That's her at 0:32 on the youtube video I posted. Ever since this show was first announced, I was always hoping they would do something like a single episode prequel showing what happened between the end of the first series and the beginning of this one. Unfortunately, with the first episode about to air, looks like it's not happening. People live pretty long in this universe. So she's basically the new Gran-Gran. There is that comic coming out soon that's set right after TLA. I did not know that, thanks for informing me. I just looked it up and the first one came out at the end of January. Legend of Korra has been leaked, I have not downloaded it (nor do I want to). I just thought people might want to know. Saw it, loved it. More of the same Avatar goodness. My only complaint is that it seem a little rushed, but otherwise, awesome! downloaded it and loved it. I'm really looking forward to this show. I loved the evolution of the society and that progress has been made industrially. Also, so what happened to Zuko's mom? Way to leave me hanging. Also, so what happened to Zuko's mom? Way to leave me hanging. The first two episodes will be online at KorraNation.com this Saturday. My thoughts: The first episode is very strong. The world has obviously changed and the show isn't holding our hand about it. The closest to a complaint I have about it is that our big bad, by wearing a mask, is pretty muchthe writer's screaming, "This is going to be another character we're going to meet and be manipulated into loving until, OH! Big reveal! He's really the guy trying to stomp Korra down!" The second episode was a little less awesome. I like the idea of Pro-Bending but it felt more like a, "Let's introduce the love interests," episode. Still, it helps that both of them are interesting characters. Can't wait for their backstory episode. I liked the second episode. They're establishing a status quo in the city between Korra, her teacher and her new friends, which is important if this show is to last. I especially like Tenzin and how his kids undermine him. Pro bending was pretty great, seemed like a natural real-sports evolution of what Toth was doing when they found her in the original series. Glad they're not leaping headfirst into the villain stuff here, Avatar was a very driven show that always had a set ending with Aang and the Firelord, this is much more open-ended so that stuff can build quietly for now. My only complaint is that the overall threat/plot hasn't really been developed yet, as opposed to The Last Airbender where they started off in a hundred-year war. But I'm sure that'll come up soon, and every single other aspect of the series is far better than TLA. The animation is spectacular, the music is phenomenal, etc. The masked guy who's being set up as a villain might not be the overall long term villain like the Firelord, he might be the equivalent of Long Feng or he might be a misunderstood or confused person like Zuko (although probably not). I hope we'll see a lot of diverse bad guys as well as this sort of character-building episode to build the world. 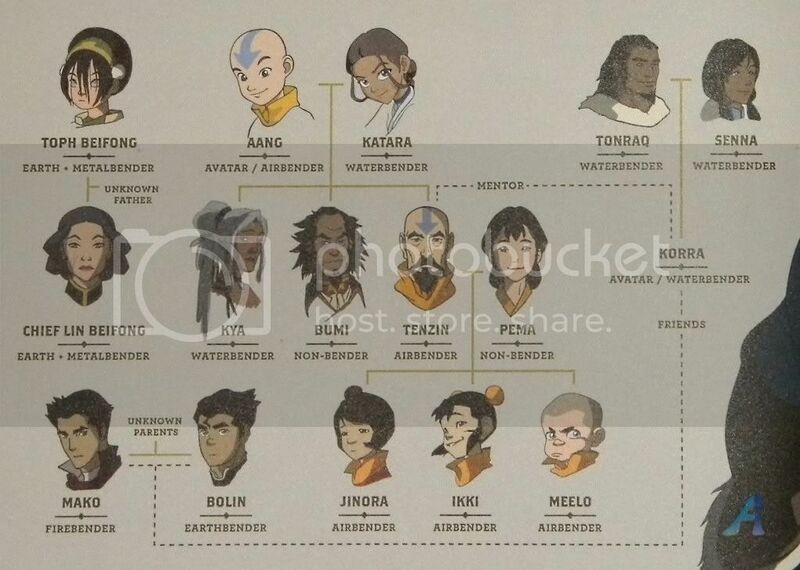 I wouldn't be shocked if masked dude is one of Aang and Katara's three children, since we've only seen Tenzin so far. Mind you, the fact that the others are named Kia and Boomy means that Boomy would have to be the evil one, and that wouldn't sit right. Also, any chance those names indicate a Water and Earth-benders? Yeah really enjoyed both of these episodes. Though there was something bothering me and I couldn't tell what is was, I think is was what KnightWing said: that the plot hasn't really been developed yet. Also it's missing the epic scope of the original series, that not really a complaint (I'm sure it's intensional to set it apart from TLA), but it's just something I need to get used to. All in all I think this will be a pretty epic series, I just wish they'd move the time slot to the nighttime like TLA. Maybe Amon is actually a descendant of Fire Lord Ozai after he lost his bending? I'm pretty sure Mako is some sort of lost son of Zuko or Azula; the resemblance (physically and attitude-wise) is too close to be coincidence. And I agree, Bumi being evil would be odd. I'm thinking Amon is using the non-bending movement to his own ends, I wouldn't be surprised if it's a move designed to lend power to the Earth or Fire portion of the council and justify making non-benders into actual second class citizens. 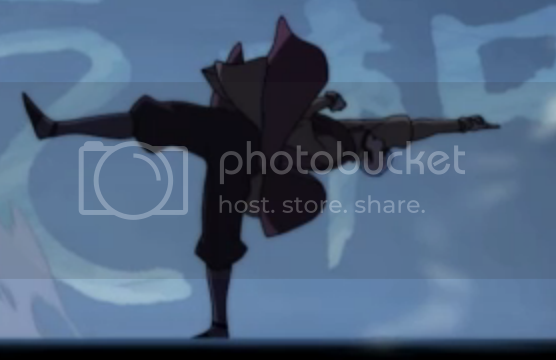 Amon has to be a bender himself right? I realise why I like Tenzin so much. JK Simmons is such a chameleon I didn't know it was him. Now that I do on second watching I actually like him even more. I like the brothers too, it's like the show already has it's Saka and Zuko. And Korra is so clearly a mix of Aang and Katara in her conception and character. Korra I don't really see as Katara too much, other than the fact that she's a waterbender. Aang, though, definitely. They even have some of the same facial expressions. Also, did anyone else catch that the Airbender in the opening is an adult Aang? He grew a beard. Huh. Earth- Kiyoshi, Fire- Roku, Air- Aang, Water- Korra. You're right it is Aang, although the shading might just be shadow rather than beard. The statue depicts him as he exists in the minds of the people, no reason to use a random beard variation in the opening. edit- in super-slowmo it does look beard-like. I'm sure we'll find out. I'd say it's definitely a beard. Maybe the inspiration for Tenzin's beard? This character sheet is leaked from somewhere; it clears up a little bit of the confusion about character genealogy. Hmm. Tenzin's skin tone is quite different to his brother and sister. Bumi not being a bender lends credence to my idea that he's actually Amon.